As classes ended, it was all eyes on AUGI. The evening was kicked off by the AUGI Annual Meeting where AUGI members from all over the world assembled to get a first-hand look at the organization. I think the single thing that impressed me the most about the AUGI Annual Meeting was the membership growth in the international communities. If I’m not mistaken, all had at least a 100% growth in the previous year, with 2 having more than 200% growth in the last year alone. Among the other items on the agenda was the Board of Director nominations. This years nominees are; Donnie Gladfelter (yes me), Mark Kiker, Mike Perry, and Jane Smith. Voting is open now, and will remain open until 8:00pm on December 17th, so go VOTE TODAY! Immediately after the AUGI Annual Meeting was arguably everyone’s most favorite event – the AUGI Beer Bust. I had the chance to help work the AUGI booth, meeting many of you along the way. 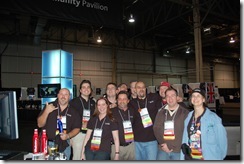 As always, the AUGI Top DAUG contect was a hit, welcoming many users trying to prove they were the Top DAUG at AU 2008. Aside from that AUGI Jeopardy was quite a hit. There were just too many humorous moments to count. As the exhibit hall closed, those of us working the booth finally had some time to socialize among ourselves (group photo above). Overall – good times were had by all! The exhibit hall did close with enough time to make my way to the Avatech client appreciation event. This year their appreciation event was at Tao, a nightclub here in The Venetian. As to be expected the venue was incredibly impressive. Maintaining a pretty strong online presence, it was quite nice to actually meet face to face with many of the folks I generally only get to communicate with online. Well the closing event is about to get started, and so I’m off to that. More to come later about all that was Day 3 at AU 2008!